Olimp Creatine Xplode is a dietary supplement containing 6 excellent forms of creatine with the highest possible absorbency, which ensure the perfect saturation of the body with this substance. This preparation is in a form of powder, which dissolves perfectly and facilitates accurate dosing. The product allows athletes to train longer, harder and shorten the time of recovery. Thanks to it, the increase in muscle mass and strength can take a much faster pace and break the previously unobtainable boundaries. Creatine is the most-known supplement in the world of athletes. It is extremely popular among professional players, for whom every element that gives a legal advantage is very precious, and among amateurs, because of the large benefits and the absence of any negative side effects. Creatine is synthesized in the liver on the base of glycine and arginine, but its production is not enough for active people, especially for the professionals. Its main store in the human body are muscles, although it is also present in internal organs such as the kidneys, heart and brain. Taurine is a biogenic amino acid, which, although it does not participate directly in muscle building, is an extremely valuable ingredient with anabolic and anti-catabolic properties. Among many properties of taurine, its ability to improve the transport of creatine to the muscles deserves a special attention. Thanks to this, the benefits of its supplementation can be even greater. The main function of creatine in the body is to support energy processes. This substance, with the participation of creatine kinase, is transformed into phosphocreatine, the compound responsible for the storage of high-energy bonds necessary to supplement the basic energy carrier, that is ATP. Adenosine triphosphate (ATP) is an energy donor throughout the body, and its high consumption occurs particularly during physical exertion. In practice, the high availability of ATP, which is indirectly provided by creatine, allows you to improve the quality of training and faster recovery. Creatine has been the subject of many scientific studies, which clearly show that taking it allows you to increase the strength and muscle mass. Thanks to creatine supplementation, athletes are able to work with heavier loads, perform more repetitions and shorten breaks between sets. For the body, greater training volume is a clear stimulus for supercompensation of glycogen and muscle tissue superstructure, which is synonymous with muscle hypertrophy. Creatine was studied not only in terms of its impact on training performance. Benefits from its use have been noted in many chronic intestinal diseases; it also had a soothing effect in the treatment of anxiety and depression. Creatine supplementation also improves mental regeneration with limited sleep time. It also positively affects the treatment of neurodegenerative diseases. Magnesium creatine chelate in the patented MagnaPower® form is a synergistic combination of magnesium and creatine. It is characterized by excellent bioavailability and shows enhanced ATP regeneration activity due to the presence of magnesium. This element activates enzymes catalyzing ATP phosphorylation, thanks to which the process takes place even more efficiently. The alkaline pH of magnesium ensures the stability of creatine, which in an acidic environment (for instance in the stomach) breaks down into an inactive form. Creatine malate is one of the most popular forms of creatine, created by combining with malic acid, thanks to which it maintains higher chemical stability in acidic environment and does not cause increased water retention. This type of supplement perfectly dissolves in water without forming an unpleasant sediment. Malate is present in the Krebs cycle, hence the use of it may result in higher energy levels during training. Creatine ethyl ester is a form of creatine subjected to the esterification process together with ethyl alcohol. Thanks to this process, it maintains higher stability and dissolves well in water. Due to the high absorbency of this form, the standard dose of creatine ethyl ester is lower than in the case of, for example, creatine monohydrate. It does not cause unnecessary water retention. Creatine alpha-ketoglutarate is a compound created from alpha-ketoglutarate (AKG) and creatine. AKG participates in the Krebs cycle and is a substance with a documented influence on the muscle anabolism and collagen synthesis. It is also a factor that modulates the mTOR pathway and promotes protein synthesis. The combination of alpha-ketoglutarate and creatine shows very good bioavailability and stability that maximizes muscle mass and strength. Creatine pyruvate in the patented form of CREAPURETM is a combination of pyruvate (pyruvic acid) with creatine. Pyruvate is present in the metabolic pathways of both sugars and fats, which are the main energy substrates of the body. Its high level can affect the exercise capacity by providing quick access to energy. Creatine citrate is a combination of creatine and citric acid, which guarantees outstanding stability and better solubility. This form shows greater resistance to the acidic environment in which standard creatine is converted into inactive creatinine. Citrate takes part in many energy transformations, it also intensifies the action of creatine itself. 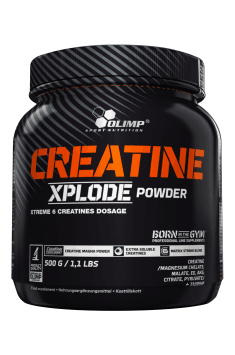 In summary, Olimp Creatine Xplode is a creatine preparation with an extremely advanced composition that totally completes the creatine stores in the body. It is directed to active people who want to break the existing barriers in building the muscle mass and efficiency in training, while maintaining full health and energy. Najlepsza kreatyna jaką brałem do tej pory :) Bardzo szybko się rozkręca, wzrost siły czuć już po kilku dniach stosowania. Do tego bardzo tania jak na taki skład. Take 3 portions a day: before breakfast and after training. Dissolve 1 portion (5g of powder – 10 units = ¼ scoop or 1 flat tablespoon) in 125 ml of water. Drink immediately after preparation. On non-workout days you may skip taking the product. To achieve best effects creatine may be combined with caffeine, beta-alanine or leucine. Using creatine is recommended to people who want to boost energy level and stamina as well as accelerate the process of gaining muscle mass. One should take care about proper intake of liquids, as their deficit during creatine use may lead to diarrhea and nausea. Moreover, it is recommended to use creatine according to the indications to avoid side effects such as the uncomfortable feeling of stomach contraction. I especially recommend taking creatine in the around-training time – 5 g before and 5 g with a protein shake after training.